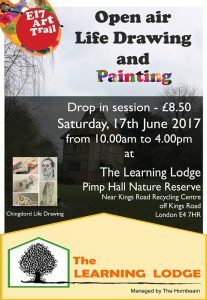 As part of the E17 Art Trail (Off the Map) we are hosting an outdoor drawing session with life model at The Learning Lodge, Pimp Hall, Chingford in the beautiful Pimp Hall Nature Reserve. Basic art materials will be provided free such as easels, A2 newsprint papers, charcoal, pencils, rubbers and putty. Sketching papers will be available for purchase at small cost. You are welcome to bring your own art materials. Open for all age groups. We will have a clothed life model for the event. Hosted by Chingford Life Drawing – a local life drawing group in Chingford. We meet up for untutored drawing with professional models from all backgrounds.